During November–December, 2006 and January and March 2007 a trial excavation was conducted north of Tel ‘Akko (Permit Nos. A-4932, A-5091; map ref. 208177–91/759014–31), prior to widening the railway tracks. 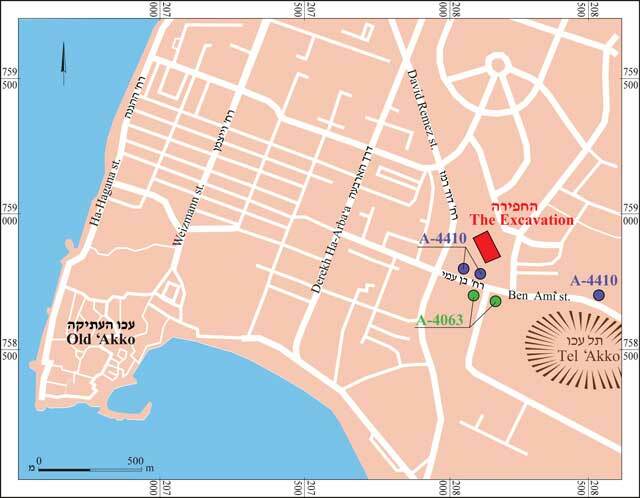 The excavation, on behalf of the Israel Antiquities Authority, was directed by A. Abu Hamid and H. Abu-‘Uqsa, with the assistance of L. Porat (area supervision), Y. Ya‘aqobi (administration), V. Essman and V. Pirsky (surveying), H. Tahan (drawing), T. Sagiv and H. Smithline (photography), D. Syon (metal detection and numismatics), N. Getzov and M. Hartal (scientific guidance) and G. Finkielsztejn (consultation). The excavation was located c. 350 m north of Tel ‘Akko and c. 2 km east of the coast (Fig. 1). In an extensive excavation conducted along Highway 85 in 2003–2007, a large necropolis dating to the Roman period was discovered north and west of the tell and east of the railroad tracks (HA-ESI 121; Permit No. A-4063). Remains of tombs dating to the Late Bronze Age I and the Iron Age II and pottery from the Persian, Hellenistic and Roman periods were unearthed southeast of the current excavation area. The excavation (c. 325 sq m) revealed four layers: Stratum I, dated to the Crusader period; Stratum II, dated to the Byzantine and Umayyad periods; Stratum III, dated to the Roman period; and Stratum IV, dated to the Persian period. Stratum IV (Persian period; early fourth century BCE). Part of a complex of living area was revealed north to Tel ‘Akko. The walls were built of small and medium fieldstones, and of rows of marine jars and amphorae (Fig. 2). Some of wall foundations were laid in a layer of clay and others in a layer of sand. Sections of floors that come up to the walls were found inside the buildings. On the basis of the ceramic finds and coins the buildings were dated to the early fourth century BCE. 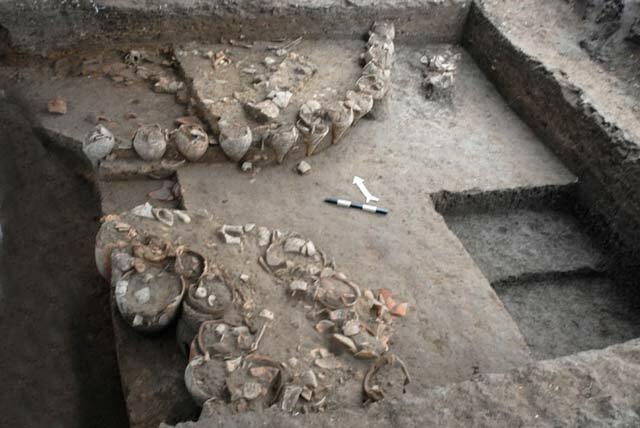 The numerous ceramic finds from this strata were mostly imported from the Aegean Sea region. These included Whole jars, mainly Phoenician jars with straight shoulders; fragments of amphorae and cooking pots imported from the Aegean Sea region, particularly the islands of Asia Minor; and red-figure Attic tableware dating to the early fourth century BCE. The architectural remains, as well as the unique construction method of incorporating jars and amphorae as building material, indicate the adoption of the foreign practices. The clay of most of the imported ceramics is from the Aegean. This suggests a likely origin of the inhabitants, possibly 'Greek Mercenaries'. They also suggest the ethnic origin of the residents, who were probably Greek mercenaries. Textual evidence describes the Persian military campaigns that reached Egypt, and the Greek mercenaries that served the Persian Empire in the conquest of Egypt and suppressing its rebellions. During this period, ‘Akko was the site of one of the bases of the Persian army that put down the Egyptian revolts, and the excavation finds might indicate the location of the Persian garrison. Upon completion of the research we will have a fuller picture of the function of the place and of the identity of its inhabitants. Stratum III (Roman period; first–third centuries CE). Large ashlar slabs covering four graves were exposed. The graves were not excavated, but they seem similar those found in the Roman necropolis excavated in the past (HA-ESI 121; Permit No. A-4063). A heap of small fieldstones was exposed in the north of the excavated area. Although it was difficult to discern how they were arranged, they too might have been used as a grave covering. Stratum II (Byzantine period until the Early Islamic period; seventh century CE) consists of a heap of medium and large ashlars that damaged the northern part of a Stratum IV building. Stratum I (Crusader period; thirteenth century CE) comprises part of a rectangular building that was founded on Stratum IV. The building had two construction phases; the floor was raised in the late phase. The western part of the building was damaged by a modern pit. The building was dated to the Crusader period on the basis of the ceramic finds. The remains of Strata II and I are fairly meager, and are undoubtedly related to activity that occurred outside the limits of the settlement, to its southwest, from the Byzantine period through the Crusader period. Along with the pottery, many coins were found in the excavation. They date from the Persian, Hellenistic, Late Roman, Byzantine, Umayyad and Ottoman periods. 2. Jars from Stratum IV incorporated in the construction of a curved wall, looking north.